* BLEED: Make your artwork 2" larger than the size of the kickdrum skin you are ordering. For example, an 18" kick drum skin should be set up as a 20" x 20". *SAFE ZONE: Keep all important logos and text 2" away from the edge of your kick drum skin. Let's use the example of a 18" bass drum skin again. You want to keep all logos and text inside a 16" circle safe area. Only the background should extend to the 20" x 20" art area. 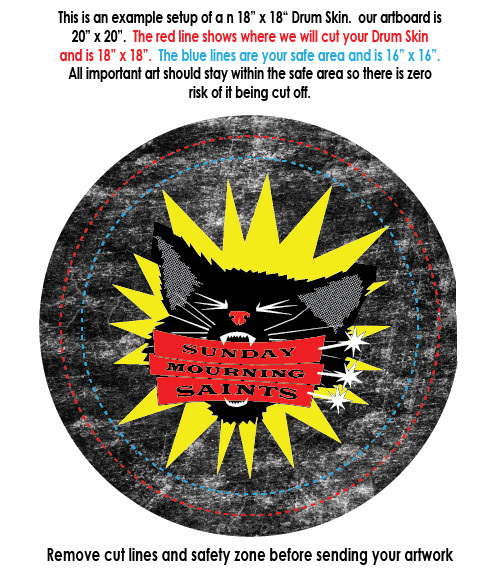 The reason we need a safe area is so we do not cut important artwork cut off any side of the final kick drum skin.